Fall is here, and MyFigueroa construction is pressing forward. The MyFig bus platforms near USC continue to take shape, with the ongoing installation of guardrails and bus shelters. 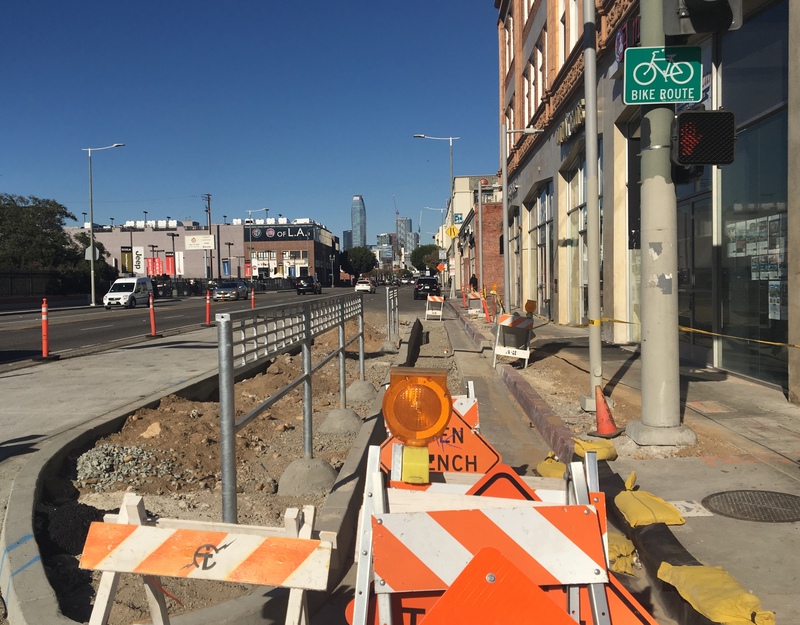 You also may have noticed a few new objects installed along Figueroa: there are now small concrete foundations which will serve as bases for wayfinding signs as well as new traffic signal poles at intersections, which will include bike signals. Work on the northern portion of MyFigueroa (between 11th St and 8th St) will begin once the schedule for that segment's construction is updated and finalized. Once an updated work schedule is in place, work in that area will be compressed to reduce impacts to businesses and traffic. Progress also continues to be made along 11th St. Our contractor has encountered unexpected issues with underground utilities in this area, which has caused work to proceed more slowly than expected. Current efforts are focused on replacing the sidewalk on the north side of 11th St as soon as possible. You will also see the installation of street lighting poles and traffic signals in this area soon. These unexpected utility conflicts have set the MyFigueroa construction schedule back slightly, but completion is not too far off. The new estimated opening date now is Spring, 2018. Stay tuned for a new detailed construction schedule, as well as additional updates. And check Twitter, Facebook, and Instagram for more info too!